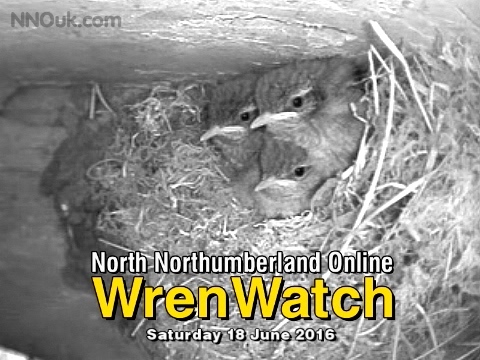 All the videos from our first nest of 2016. Monday 6 June 2016: Mr and Mrs Wren are nesting in a dark passageway between two houses and already they have tiny chicks. We set up the camera today, 6 June. This passageway has been a nest site for swallows for at least 35 years and probably much longer. But last year a wren nested for the first time that we know of. It took over a former swallow's nest and lined it with greenery. This could be because the garden of the house switched from being grass to a vegetable plot and perhaps provides more insects as food now. 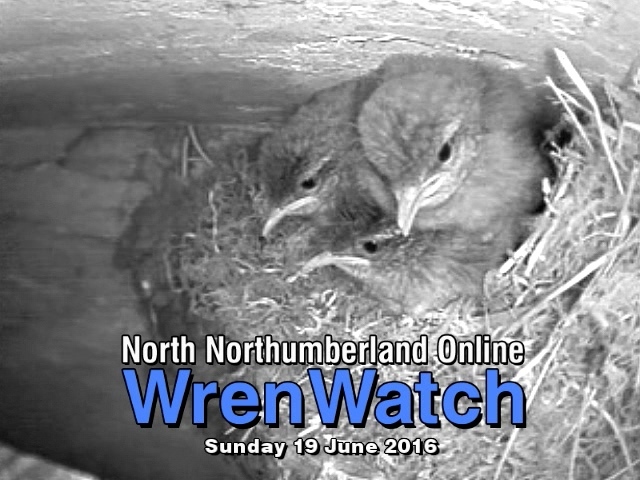 Friday 10 June 2016: the chicks have grown quite a bit in the four days since our first video. Daddy wren is doing his best but it looks as though he may be a first time father. Saturday 18 June 2016 now we can see there are four chicks -- one more than we thought. There's some interesting behaviour in this latest video. 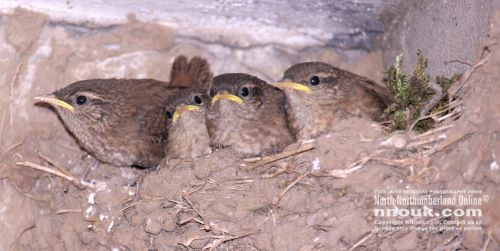 When a person walks through the passageway where the nest is, the chicks sink into the nest and are silent. Once the danger is over there's a burst of birdsong from the parent birds, as if to say "the coast is clear", and this is recognised by the chicks. 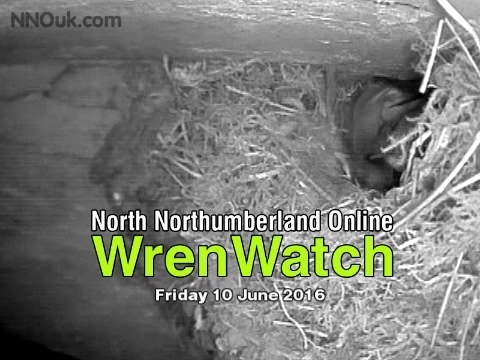 Then mum and dad arrive with food and check the nest. Sunday 19 June 2016: the boisterous birds are ready to leave the nest and there's excitement as each one in turn takes the plunge. Notice how the final young one flattens its feathers before leaving. In seconds it seems to change from a fluffy chick into a sleek bird. The parents return several times to check the nest. One takes away some feathers. And that's it, they've gone. Just fledged and perching on another unused nest. Wrens and swallows have nested in several different corners in this passageway and we have no idea which spot they will choose next, so the camera must be put in place after thay have moved in. 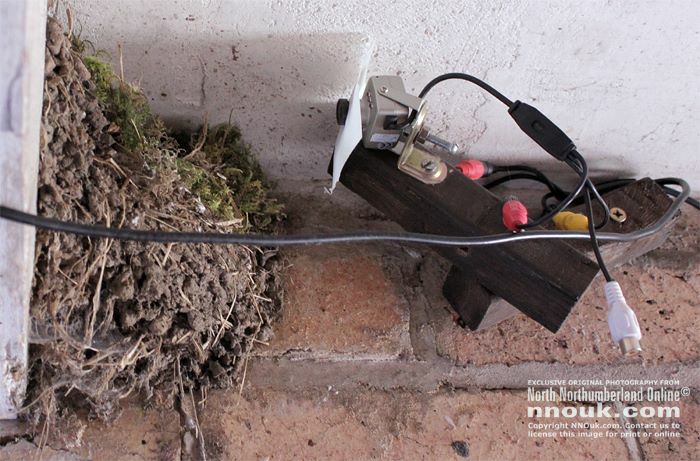 During the winter we screwed small wooden battens to the wall close to each nest. The camera is on a second batten which can be screwed onto the first very quickly. We know the distance between the camera and nest, so we focus the camera beforehand. This keeps disruption to a minimum. A single cable takes power to the camera and routes the picture and sound into the house where they are recorded on a DVD recorder. The cameras we use are from the website spycameracctv.com. The tiny camera has a wide angle lens and six infra red LEDs to light the scene. It is mounted on a small bracket which has a screw hole. What are the pluses and minuses? The camera is solid and gives a sharp picture. The wide lens is ideal if the camera is inside a cramped nestbox. The LEDs work well. We diffuse the light from them slightly to give a softer effect by putting a piece of translucent plastic (cut from a plastic milk bottle) around the lens. When the main source of illumination comes from the LEDs the image is monochrome with a strong blue or purple tinge. The LEDs are switched on all the time. Although this is a colour camera, it doesn't have the filter which normal digital cameras use to remove the infra red component from light. Infra red is found in daylight and some artificial lighting so in most situations the camera doesn't reproduce colours accurately. For example blue appears purple. An exception is under energy saving bulbs where colours look normal. The camera comes with a 20m cable. This carries power to the camera and the video and audio signals from it. Although the camera has a built in microphone we found it to be poor with a very loud hum. So instead we use an inline microphone which is offered by the same company as an extra. Even with this there is still a slight hum on the audio. The camera comes with a two year guarantee and customer service is good in our experience. Despite the limitations we have described we feel this is a good product for the price and an inexpensive way to get started and have a lot of fun nest watching. 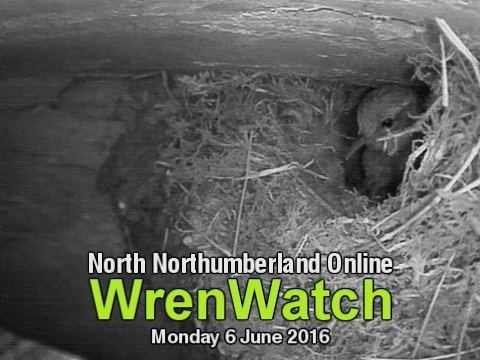 We have a second camera in the hen house and that's a whole other bird watching experience!